Looking the BEST Valentine’s Day Cards this year? We’ve got them – FREE Skating! 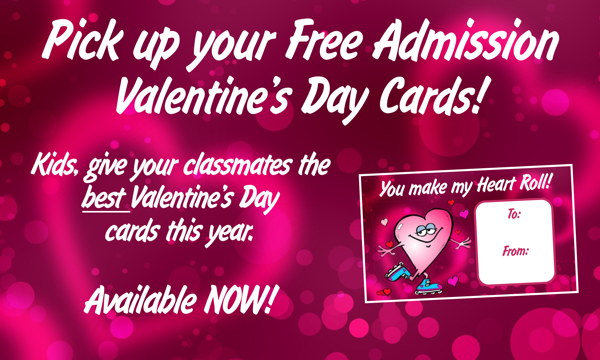 Order now to pick up your FREE Admission Valentine’s Day cards! Cost – $4.99 + tax per pack – purchase here, then pick up at the rink. Passes distributed at Cheap Skate will not be honored. Names (To and From) must be filled out in advance, or pass will not be honored. Must purchase in advance. Cards not available for purchase at the door. Click here to purchase. Pick up is available beginning Friday, 2/1/2019.